Personal is an Argentine GSM operator who ranks third in the local mobile market. Moreover, it has excellent coverage in the country and the number of subscribers exceeds 19 million. 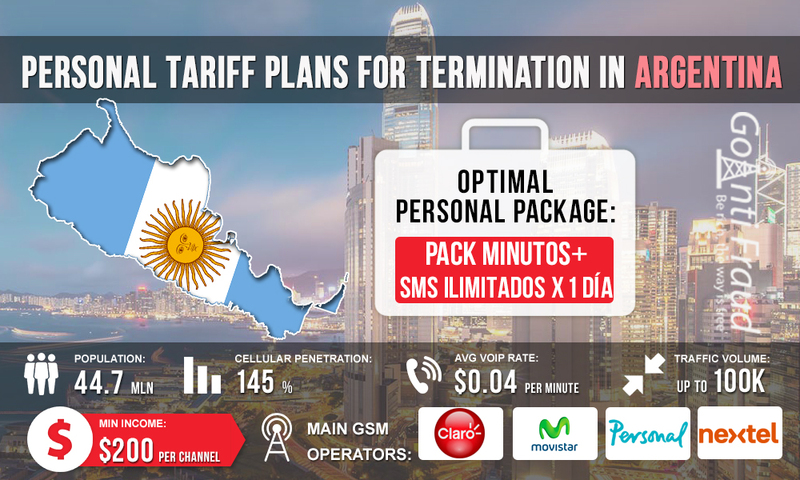 Using the SIM cards of Personal in VoIP traffic termination business, the terminator can earn good money on the difference in the cost of international and local calls. The cost of Personal chips ranges from $0.5 to$ 1. After activating the card, the subscriber is given a loan of about 30 cents. Also available, is a Prepago chip at $13 with a loan of $10, which provides for bonuses in the form of 30 minutes of international calls, 100 minutes of national calls and mobile Internet traffic. Thus, a minute of call costs $0.03 (with a standard outgoing call rate of $0.29). PACK 150 MIN A PERSONAL Y 150 SMS X 7 DÍAS. The cost is $0.8, duration - 7 days; advantage - 150 minutes for calls within Personal network. MINUTOS + SMS ILIMITADOS X 7 DÍAS. The cost is $1.1, duration - 7 days; advantage - unlimited within the Personal network. MINUTOS + SMS ILIMITADOS X 3 DÍAS. The cost is $0.7, duration - 3 days; advantage - unlimited within Personal network. MINUTOS + SMS ILIMITADOS X 1 DÍAS. The cost is $0.3, duration - 1 day; advantage - unlimited within the Personal network. MINUTOS + SMS ILIMITADOS X 30 DÍAS. The cost is $2.7, duration - 30 days; advantage - unlimited within the Personal network as well as calls to other operators’ numbers. To work with gsm gateway voip asterisk, choose MINUTOS + SMS ILIMITADOS X 1 DÍA plan. With this plan, a minute of call will cost you about $0.001 (with the VoIP equipment operating for 5 hours a day). Thus, the minimum income of an entrepreneur working in the termination business will be $ 200.